With the warmer spring weather comes more and more pesky bugs. Wasps are particularly active in the spring and summer and seem to be able to find places to nest near homes, businesses and where your kids play everyday. No one wants to get stung, and if you or a family member has an allergy, you want to make sure to get rid of and keep the wasps away from your property. Eco Tech, a natural pest control service offers professional wasp removal services for the Mound View, MN and surrounding areas. We offer all-natural, organic solutions to control insects, including wasps in your home or your business. We believe that our use of all-natural products protects your property from insects while keeping you and your family safe. Start this spring off right — eliminate wasps in your yard once and for all so that you can enjoy the spring and summer weather outdoors without worrying that you or your guests will get stung. Wasps can nest in trees, in holes or cracks in your home, or your business, making you vulnerable to running across them anytime, day or night. Removing their nests yourself can be very difficult and you risk multiple stings in the process. Hiring a professional team to do the job ensures that all nests on your property are removed safely once and for all. Eco Tech’s staff is trained in handling these insects, can remove the wasp nest, and will use a non-toxic organic product line that eliminates the wasps without harming people in the area. Eco Tech has more than 15 years of experience providing organic insect, pest and animal control services for customers in the Mounds View, MN and the Twin Cities metro area. Our team is honest, professional and customer service oriented, so you can be sure that you will get an honest and fair assessment of the pest issue on your property. We think that our work speaks for itself and we never require a contract so you are free to just use the services that you actually need. 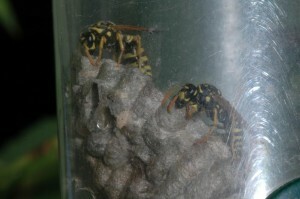 So, if you see wasp nests on your property that you want to eliminate, give our team a call at 1-763-785-1414. We also offer a 24/7 response team that can be reached after normal business hours at 1-612-237-8282.